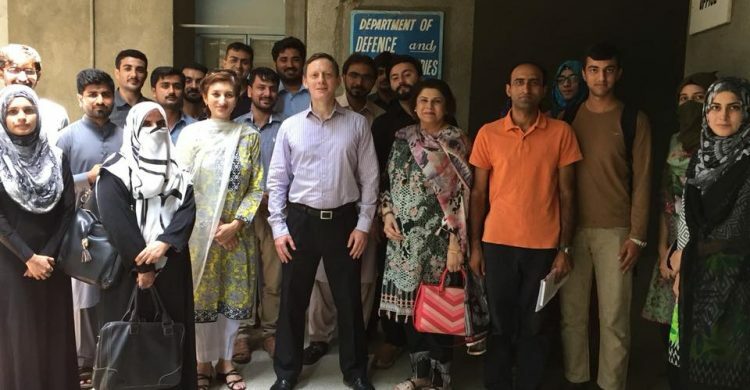 On June 26, 2018 Professor Edward Newman from the School of Politics and International Studies, POLIS University of Leeds was invited to the DSS Department. His central thesis, which is part of a book project covering Pakistan as well, was What is the significance of Food Riots? Food Insecurity, Injustice and Upheaval. Covering an extremely critical issue, he dwelt in detail on food price hikes and corresponding impact on political stability, how decisions undertaken in international food markets impact domestic markets, none of which works in isolation. The intervening factors that affect food prices and enhances scarcity or deprivation, such as civil to interstate war, environment and climate change effects, water scarcity, other horizontal and vertical conflict drivers, human development indicators. However correlation of various elements need not be taken as a factor of causation. The grievance and food security is proportionally related to governance parameters, and the need is for an integrated global governance to mitigate the politicization of food security. The audience comprising students and faculty engaged in a very engaging discussion covering issues such as the role of middle agents, patent wars, MNCs and corporate social responsibility, market protectionism trends, the upcoming food wars between major producers and consumer markets and the quality and type of governments that impact food security.